Written by Janet Choi on September 11, 2015 . The idea here is to encourage engagement. You can and should adjust the features and functionality of your product, but the most valuable way to retain the customer is by contacting them directly. Let’s take a look at how 7 companies use emails to contact people directly and keep them engaged. Subject: The Buffer for your Twitter profile, @CustomerIO, is empty. Here’re three more suggestions! Buffer knows that their users are getting value out of their product as long as they have posts publishing from their queue. So the perfect time to reach out is when your queue becomes empty. They get a lot right in this email. First off, the message focuses on the customer’s point of view. The notification is framed as a positive — “Great work setting up all those posts. Now let’s go queue up some more!” instead of taking an alarmist “Oh no! Your queue is empty! Go add posts so you’re not a loser!” Then they explain the reason why acting on their call is good for you, tapping back into their users’ motivations — to grow followers. 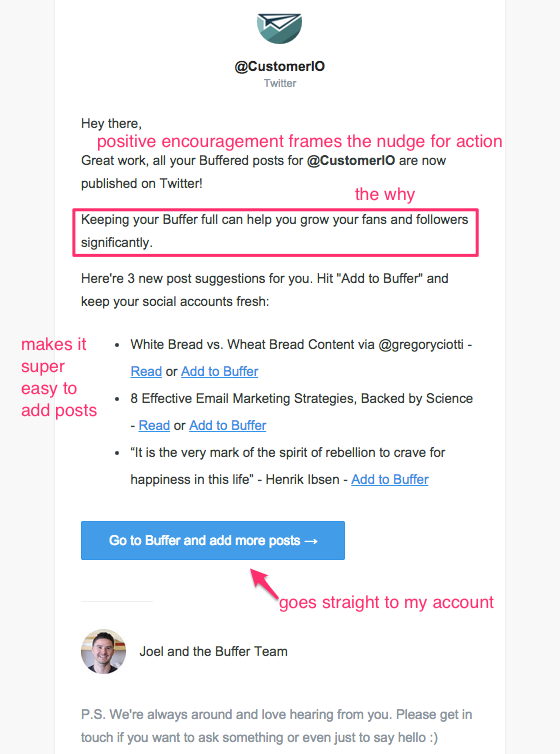 And in a master touch, they provide quick ways to add new posts straight from the email. 2. Mention motivates instead of slipping away. 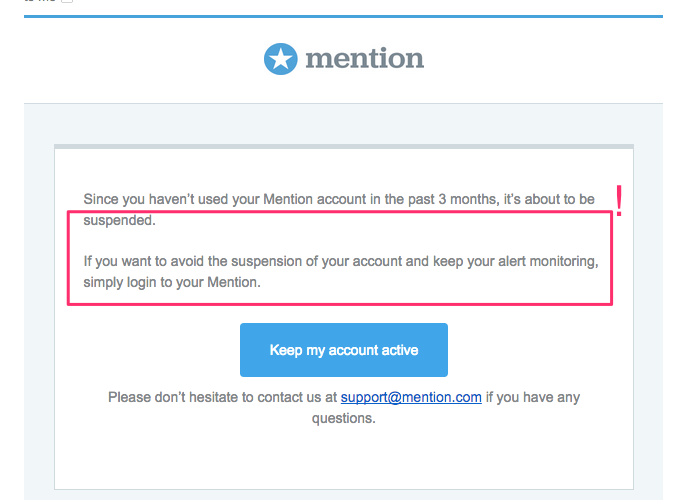 Here’s an interesting tactic from Mention, the media monitoring tool, taking a proactive approach to inactivity. They throw in some loss aversion to spur people to action with the message: act now, or lose your account. Subject: Your Mention account is about to be suspended! Their message sounds a bit alarming by referring to the impending fate of the account as a “suspension.” But this puts the ball back into the user’s court — will reading the message cause someone to log back into Mention or choose not to act? That’s a great gauge for the company to determine which segment of users they should focus their attention on, while reminding folks about the app. 3. Olark follows up on activation. Subject: Ready to chat with customers? This is a short and sweet message. It’s 2-3 sentences, delivered at the right moment based on actual behavior, to help keep new Olark users on the path to progress. Plus there’s some great proactive communication with customers on certain plan levels — if you reply with your website address, one of their real human Olarkers will come chat with you. That’s engagement! 4. Viki follows up on interest to make the sale. Viki is a global TV streaming site, powered by its community of passionate fans who help translate shows into more than 200 languages. Like most TV streaming services, Viki has a premium plan called Viki Pass, which offers no ads, premium content, and HD quality. Subject: Give Viki Pass a Try! I noticed this email in my inbox after I checked out their Viki Pass page one day. It not only reminds me of all the pass benefits, there’s an enticing free trial offer to nudge me to give it a whirl. 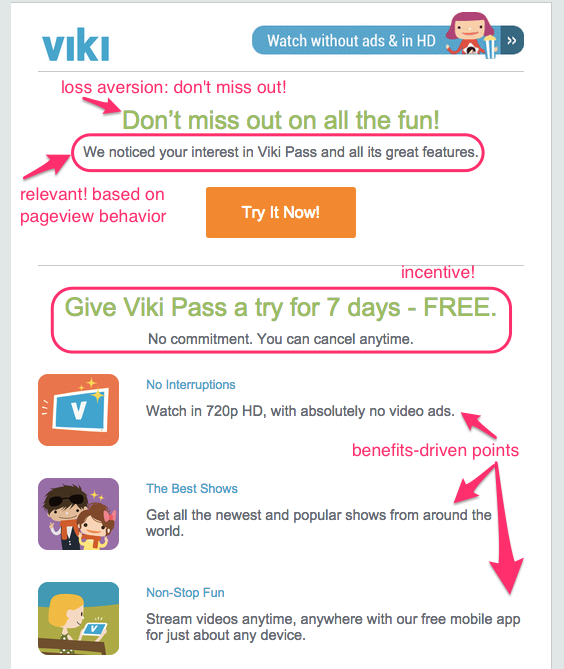 Viki knows when certain users are better leads for the Viki Pass because they take the time to look at a specific page, and by triggering this follow-up email with a reminder and incentive, they can garner more upgrades. 5. 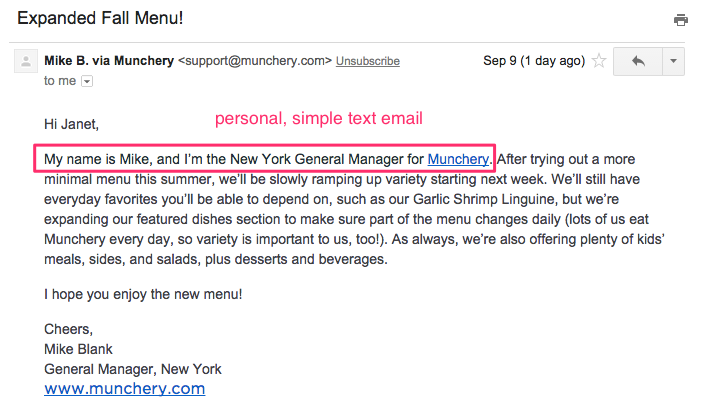 Munchery gets personal to stand out. Munchery often sends beautiful image-filled emails, showing off delicious-looking dishes from their menu. But it was actually the personalized touches in this email that caught my eye. Subject: Expanded Fall Menu! First, sending it from an individual (Mike B. via Munchery) instead of the usual company name got me to open the email. Then, the simply-formatted text was easy to skim (though there could have been a paragraph break or two) so that I read the whole message. You might be familiar with this type of automated personal email. It’s usually simply formatted, as this one is, to look as if it were dashed off in a personal email client like Gmail rather than a mass marketing email tool. These days, many SaaS businesses use this tactic soon after sign up to extend a personal welcome. But you can use it at many other junctures in a customer lifecycle, from reaching out to ask why someone cancelled or to build on existing emails with a more personal touch. For me, it was nice, rather than annoying, to get a change from the traditional marketing messages to see this short message after Mike B. had already extended a personal welcome to Munchery, specifically in my location of New York. 6. Oyster leaves the door open after cancellation. 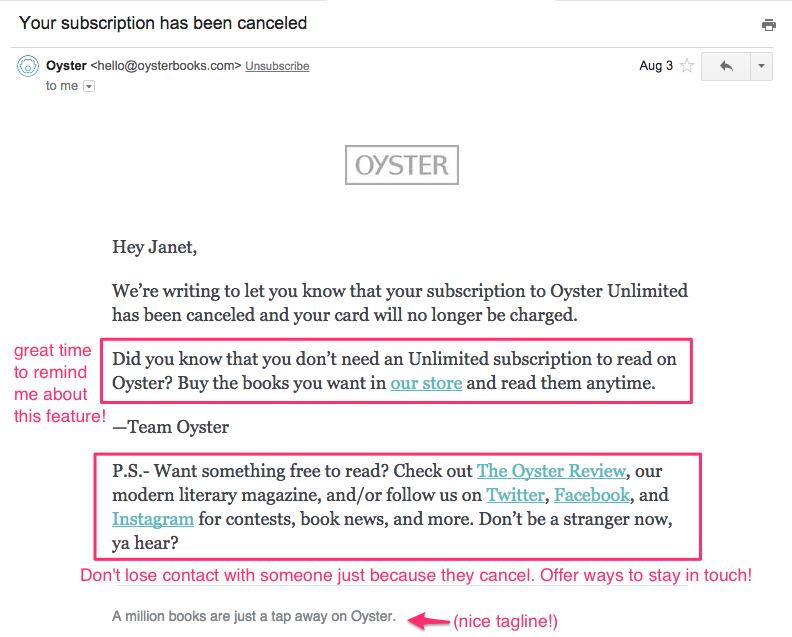 Here’s a transactional email from Oyster, confirming a subscription cancellation but also taking advantage of the fact that a cancellation doesn’t mean it’s a goodbye-forever type of situation. Subject: Your subscription has been canceled People may want to stay in touch with your content or product updates, or even keep participating but at a different level or plan. Don’t write off relationships with people just because they hit cancel. Keep the conversation going and you may retain a community member, brand advocate, or return customer. 7. Tumblr congratulates its community, not themselves. Most company email announcements are full of themselves — we did this great thing, we’re excited about that awesome feature. 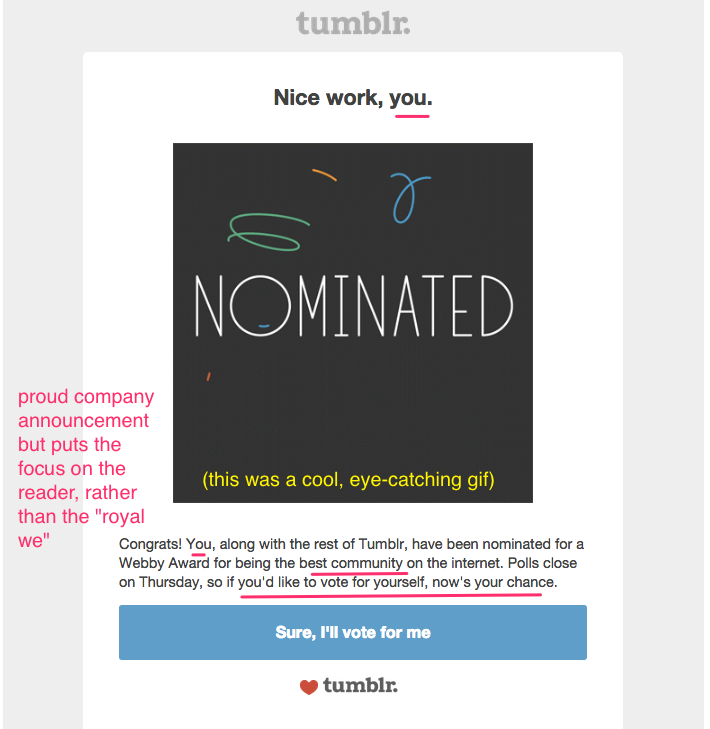 But this email from Tumblr (the only non-behavioral email included in this list), sharing news of its Webby Award nomination (and inviting votes), centers the copy around its recipients. Subject: Oh, hey, nice Webby nomination Not only is this “you”-centric approach in line with the nomination for “best community on the internet” — it’s also a great reminder to consider the reader’s perspective and ensure your communication with them is actually a two-way street. Rather than limit the scope of “relationship progress” to what customers can do for a company, why not invert it and chart out all the ways a company can help further the customer’s relationship with their greater need?